Never under price your cakes again! How do you price Dummy cakes? Customers often want the look of a large tiered cake, but do not need that many servings for the number of guests attending their event. 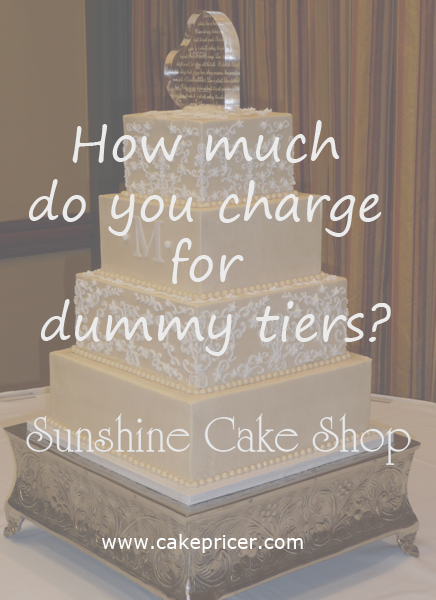 The question is, do you charge less for dummy tiers than actual cake tiers? Two of the above tiers are dummy cakes. All tiers are covered in buttercream icing. Which 2 are actual cake? Hint, 1 is iced smooth and the other is piped. Dummy cakes do have a cost associated with them in the actual purchase of the item, that may or may not be just as expensive as the cake recipe, however, there should be no time charges included for baking an actual cake. Dummy cakes do not need support inside them. Depending on the type of support you use, this can be a significant savings. In addition to the price of the supports, the time it takes to install the supports is saved as well. Dummy cakes are not torted (split into extra layers). Dummy cakes do not have filling. The cost of the filling itself as well as the time it takes to make the filling (if from scratch) is saved. Obviously it is up to the individual business whether or not they charge less for dummy tiers, but let’s see what Cake Pricer says. To answer the above question, the 2 middle tiers are dummies. This was a second marriage for both the bride and the groom and they wanted something large, but were having a relatively small wedding. They only needed 60 servings for their guests. They wanted to save the top tier for their first anniversary, so it had to be real. We decided that it would be easier for serving if the 2 middle tiers were dummies because the top 3 tiers could easily be removed and then the bottom tier served to the guests. The total price for this cake is $473.00 with an hourly rate of $15.00/hour and a 20% profit percentage. Because of the low number of servings, the price per serving is $5.26/serving. With the extra servings, the price per serving goes down to $3.32/serving. How does that change in price break down? The calculated total number of hours for cake preparation and clean-up is over 4 hours less. All other time remains they same. The overhead amount is slightly less because no baking pans were used in the preparation of the 2 middle tiers. The time it takes to prepare and bake the extra cakes and make the extra filling, as well as additional time to torte, fill, stack, and dowel the 2 additional tiers makes up the added cost. The total cost of all tiers is $44.17 for the cake with 2 dummy tiers. The total price of the tiers went up $14.26 to $58.43. This customer chose their flavors to be Traditional Wedding (Almond) Cake and simple Buttercream filling on the real tiers. Had they chosen more expensive cake and filling flavors the difference in price would have been quite a bit more. For instance, a jam filling takes much longer to make and filling with a jam filling takes longer than filling with buttercream. So basically, it is up to you as to how you price cakes with dummy tiers. Personally, I preferred to offer the cheaper version for them instead of insisting that they have way more cake than they needed. Plus, they may have decided to use a different bakery instead of me if I insisted on pricing the dummy tiers the same as cake tiers. By using my spreadsheet, I was able to give them a break on price without compromising my hourly rate or my profit percentage. In addition, I also received an excellent review from this customer as well as referrals. You can’t really beat that!